Overview - Royal Tenenbaum (Gene Hackman) and his wife, Etheline (Anjelica Huston) had three children—Chas, Margot, and Richie—and then they separated. Chas (Ben Stiller) started buying real estate in his early teens and seemed to have an almost preternatural understanding of international finance. Margot (Gwyneth Paltrow) was a playwright and received a Braverman Grant of $50,000 in the ninth grade. Richie (Luke Wilson) was a junior champion tennis player and won the U.S. Nationals three years in a row. Virtually all memory of the brilliance of the young Tenenbaums was subsequently erased by two decades of betrayal, failure, and disaster. The Royal Tenenbaums is a hilarious, touching, and brilliantly stylized study of melancholy and redemption from Wes Anderson. There are many conflicting ideas about cinematic form and style in the world of filmmaking. Some directors prefer to engender a stark sense of realism, letting the narrative content itself take center stage through unobtrusive compositions, production design, and editing. Other filmmakers, however, take the opposite approach, opting to litter the frame with visual flare and formalistic technique, leaving reality behind for a heightened sense of motion picture lyricism. With 'The Royal Tenenbaums,' Wes Anderson belongs to that latter category. Though he certainly has his detractors, the director's distinct visual style and penchant for eccentric characters and oddball stories has led to some truly imaginative movies. 'The Royal Tenenbaums,' his third feature film, is among his most stylistically excessive efforts, and while its gaudy, carefully mannered aesthetic and script can get a bit too quirky for their own good, the end results are still very funny and enlightening. Told through the framing device of a book being read to the audience, the story focuses on the unusual Tenenbaum family and their various dysfunctional relationships with one another. After discovering that his estranged wife (Anjelica Huston) plans to remarry, Royal Tenenbaum (Gene Hackman) hatches a devious plot to reconnect with his loved ones. Reluctantly accepted back into the fold, the deceitful patriarch then struggles to make amends for his past mistakes, but unfortunately can't seem to quit making new ones. Meanwhile, Royal's three adult children, Margot (Gwyneth Paltrow), Chas (Ben Stiller), and Richie (Luke Wilson), continue to deal with their own hardships and emotional hang-ups. Together the eccentric family will have to overcome their past failures if they ever want to find any semblance of happiness. While the director's previous features ('Bottle Rocket,' and 'Rushmore') certainly have their fair share of stylistic and narrative quirks, here Anderson takes things to a new level, eschewing reality for a heightened, slightly exaggerated quality. Everything -- from set dressings, wardrobe choices, and even the characters' mannerisms -- works to create a faintly parallel world to our own, full of blinding color and idiosyncratic charm. The film simply oozes style, and the movie's opening scenes -- which feature various montage sequences used to set up the complicated family history for the narrative's eclectic ensemble -- are a cornucopia of delicate cinematic flash. Though Anderson mellows out a bit when the main story starts to find its groove, the director's heightened, but still very methodical style pervades the running time. Heavily influenced by a variety of cinematic movements (most notably the French New Wave), the director wears his numerous inspirations on his sleeve. With this in mind, the film's aesthetic has a very European flavor to it, but Anderson manages to synthesize his influences into a pretty unique style. Voiceover narration, chapter breaks, slow motion, montages set to music, eccentric production designs, and colorful costumes, are all joined by gorgeous widescreen compositions, pans, tracks, dollies, zooms, tilts, cranes, and just about every other type of camera shot and movement imaginable. Anderson utilizes the widescreen space to its fullest, with artfully balanced framing that enhances subtext through blocking and negative space. Likewise, the director's sparse camera movements are not just relegated to horizontal shifts, but vertical as well, taking advantage of the entire screen from all directions. An extended shot near the end is particularly impressive. The sequence shifts from one misfit character to the next through a series of complicated movements, letting the camera literally and figuratively bind the dysfunctional group together. As visually stimulating as Anderson's potent aesthetic can be, there are times when the style becomes overkill, and the idiosyncrasies of the narrative and characters grow tiresome and borderline pretentious. A little more restraint could have actually gone a long way here. As it stands, the quirky excess occasionally feels forced and is sure to annoy some viewers. Thankfully, however, this calculated approach proves to be more than just a mere cinematic affectation, and there is real substance layered beneath the whimsy. Through Royal and his oddball family, the filmmakers weave a humorous and bittersweet story about emotional healing, failure, and redemption. Under the deliberately peculiar costumes and behavior are genuinely wounded characters full of pain. Through their struggles the director displays a strong command of tone, blending laughter and heartache. The mostly dry, deadpan humor is also given a certain goofy charm, and despite the prevalent comedy, the picture retains an almost bizarre sense of palpable melancholy throughout. Without the right cast, the movie would have surely collapsed under its own artifice. Thankfully, the ensemble is perfectly matched to the material. Gene Hackman turns in one of the best performances of his storied and impressive career. As Royal, the actor is both detestable and irresistibly charming. His comical scheming and oddball friendship with his loyal sidekick Pagoda (Kumar Pallana) provide some of the movie's biggest laughs. Not just an aging, selfish manipulator, the actor reveals real heart within the character, leading to a truly affecting arc. Ben Stiller, Luke Wilson, Gwyneth Paltrow, Anjelica Huston, Owen Wilson, Danny Glover, and Bill Murray are also exceptional in their roles (though Murray is a bit underutilized). Together the bizarre group forms a believable and humorously dysfunctional family. As unrealistic as some of the film's superficial elements are, the performances mostly retain a level of realism and the actor's imbue their characters with poignant sorrow and awkward humor. With an oddball story full of somber drama and dry humor, 'The Royal Tenenbaums' proves to be both funny and emotionally resonant. Anderson's whimsical visual style and narrative quirks can be overpowering at times, but there is real substance beneath the methodical excess. Though slightly heightened, there is a paradoxically understated quality to the whole affair as well, keeping the emotions and performances raw and honest. Whether you love or hate the director's approach there is no denying that there is real talent on display here, and there are single shots in this film that feature more attention to detail than other movies have in their entire running time. It might not be among the director's very best work (though I like all of his films, my personal favorites are 'Rushmore,' 'Fantastic Mr. Fox,' and this year's utterly sublime 'Moonrise Kingdom'), but it's still a strong entry in his filmography that demonstrates an interesting but imperfect evolution of his style. 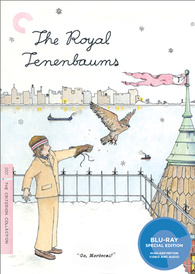 Criterion presents 'The Royal Tenenbaums' in their standard clear case with spine number 157. The BD-50 region A disc comes packaged with a booklet featuring an essay by Kent Jones. An additional foldout insert with drawings by Eric Anderson is also included. The film is provided with a 1080p/AVC MPEG-4 transfer in the 2.40:1 aspect ratio. If nothing else, Anderson is known for his use of sumptuous colors and creative production design, and the video transfer here is an absolute feast for the eyes. The print is in excellent condition with only a few insignificant specks here and there. A light layer of natural grain is apparent throughout the runtime, giving the picture an authentic filmic quality. Clarity is astounding, with sharp fine details apparent in faces, objects, clothing, and sets. The mesmerizing production design is filled with tiny nuances and little creative touches, and the high definition transfer highlights all of the filmmakers' hard work beautifully. Beyond the impressive detail, colors are the real standout here, and the movie's warm palette of rich hues bursts from the screen. The image has a predominantly orange/yellow glow to it, but blues and especially reds pop with an aggressive level of gorgeous saturation. With that said, some might find the intense colors to be almost too punchy and slightly overpowering. Contrast is also very high, with bright whites and deep, inky blacks. The hot contrast and high saturation levels can give the film a comparatively harsh look, but the style is in line with the director's intentions and works well to complement the heightened, quirky qualities of the story and characters. Some very minor aliasing/shimmering is just barely visible in a few shots around certain objects and articles of clothing, but this really isn't an issue. 'The Royal Tenenbaums' is a visually arresting film fueled by gorgeous colors and painstaking production design. While the stylized look can be a bit harsh, this director approved transfer from Criterion does the movie justice, and the resulting image is full of wonderful depth and detail. The audio is presented in an English DTS-HD MA 5.1 track with optional English subtitles. Quiet and delicate, the mix is understated and subdued, but serves the story and visuals well. Dialogue is clear and crisp throughout with strong fidelity and resonance. The soundstage is extremely frontloaded, however, and notable surround use is very sparse. Save for some music cues and a few fleeting isolated effects (flashing cameras, for instance), the rear speakers are all but silent. With that said, subtle effects work is appropriately spread across the front three speakers. Directionality and imaging are smooth and natural and the movie's fantastic soundtrack comes through wonderfully. Dynamic range is wide and free of distortion. With few exceptions, low frequencies aren't particularly noteworthy but the content doesn't really call for any room shaking thump. The restrained audio presentation suits the material well and opens up nicely during key musical montages. A true sense of auditory immersion is never really achieved, but the mix succeeds where it's important. Criterion has put together a very nice set of supplements including a commentary, behind-the-scenes featurette, and interviews. All of the special features are presented in upscaled 1080i and Dolby Digital 1.0 audio with no subtitle options. Commentary with Wes Anderson - The director provides a laidback and informative track full of trivia and entertaining anecdotes. Anderson discusses the film's stylistic influences, the narrative's real life inspirations, the collaborative writing process with Owen Wilson, the movie's themes, what it was like to work with animals, and various other little bits about the production. With a nice, steady stream of information, fans should find a lot to like here. With the Filmmaker (HD, 27 min) - This is an interesting behind-the-scenes look at the film's production. Eschewing traditional promotional fluff, the doc takes on a very fly-on-the-wall quality following the director as he plans shots, approves production designs, supervises set construction, works with actors, watches dailies, problem solves different challenges on set, and oversees editing. Interviews with Anderson are also interspersed where he discusses the film's influences, his story process, and gushes over the actors' performances. An intimate look at the director in action, fans will definitely want to check this out. Interviews (HD, 27 min) - Short interviews with Gene Hackman, Anjelica Huston, Ben Stiller, Gwyneth Paltrow, Luke Wilson, Owen Wilson, Bill Murray, and Danny Glover are viewable separately or together. The actors discuss how they got involved in the project and provide details on their characters and what it was like to work with the director. Additional behind-the-scenes footage is also interspersed throughout. Cut Scenes (HD, 2 min) - Two brief deleted scenes are viewable together. The sequences offer a cameo from Olivia Williams and a romantic dinner between Huston and Glover but for the most part are pretty skippable and add nothing to the proceedings. The Peter Bradley Show (HD, 26 min) - This odd but amusing supplement focuses on a fictional talk show parody of Charlie Rose. The host interviews several actors from the film who all played very minor characters (or in some cases, glorified extras). Ill-prepared, the host constantly mispronounces their names and asks asinine questions. While there aren't really any insights to be gained here, the show is quite funny. Scrapbook (HD) - This section offers a few different photo galleries. "Stills" provides sixty production photos. "Miguel Calderon" offers a gallery of four of the artist's paintings and a short Studio 360 radio segment (5 min) focused on the artist and his painting "Bad Route" which is featured in the film. "Margot" is a collection of portraits of Gwyneth Paltrow's character that are seen in the movie. "Storyboards" provides eight annotated script pages by Wes Anderson with little storyboard sketches. "Murals" offers fifteen stills of Eric Anderson's wonderful murals from the film. "Covers" is a gallery of eight fake magazine and book covers used in the movie. Trailers (HD, 4 min) - Two trailers for the film are viewable together. A quirky story about family, emotional healing, and redemption, 'The Royal Tenenbaums' is a funny and visually creative film. While Anderson's stylistic excess can be a bit much at times, the director's underlining themes are strong and the performances are great. The video transfer is a feast for the eyes, offering sumptuous colors. The audio mix is a bit restrained and basic, but suits the content well. Supplements are informative and entertaining, offering some great behind-the-scenes footage and interviews. Though not my favorite of Anderson's work, this is a very good film and Criterion has put together a great disc. Highly Recommended.